To perform business process flow automation and instance monitoring, according to the order, process activities status and the access permissions granted to the process participants. › According to the access permissions of the logged-in user the application displays a process menu and the active processes ordered by different criteria. › Choosing one process, AkFlow shows a list with the process instances having uncompleted activities in which the user has access permissions. › By selecting "My Task" in the options menu, the user can see the activities that are pending to complete, grouped by process. › When choosing an activity to complete it, the associated form is opened. - If the form is leaved without complete the activity, the instance remains unchanged. - If the activity is completed the process flow moves on, so the next activity to complete is showed if the user has permissions to do it. If not, the instance disappears from the pending list. 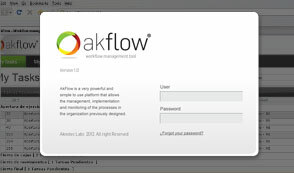 AkFlow is made using VisualStudio .net 2010 and MSSQL 2008. It is only necessary to have an Internet Information Service (IIS) instance with the .NET 4 and MVC3 installed, and a MSSQL instance running. This module manages the set of processes that each project contains. › Each process can have lots of instances, initiated by a lot of users. › Each user can access to the instances where he has access permissions granted in the parent process. › Each user can access to the initiated instances, or just start a new one, if he has permissions to do it. › In this module it is possible to define different types of process that group the processes according to some criteria. › These are managed by a menu that allows displaying the dependent processes. › The user can see the process types for which have access permissions. 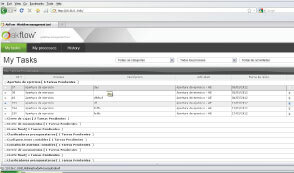 › By choosing an instance, the user can see the form associated to the activity and complete it. › At the bottom, there are a Complete and a GoBack button to move forward or backwards (if it's possible to do it). As an option in the process menu, this section shows a summary of activities that are pending to complete, grouped by process. The user permissions have three levels: type of process, process and activities. Many users can have permissions to init and/or remove a process instance and others can have permissions to complete process activities. Once the processes are designed and the services constructed, deploying AkFlow in your organization is a very simple and fast process, because it is a lightweight web application, enabling all users in the company to access it easily. 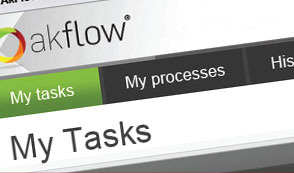 Using AkFlow your organization can integrate Business Processes in a friendly and simple to use web interface, with possibilities of reusing forms implemented using any web development technology leader in the market (PHP, Java and .NET). Choosing AkFlow represents time benefits for your organization, reducing about 35% of the time needed to deploy an average process compared to other products of similar performance. The price of AkFlow is more cost effective than similar products, allowing to the company savings of approximately 50% along the whole project. Integrates its processes in a friendly web interface and simple to use. Enables reuse forms deployed to any web development technologies market leaders. ©2012 Aknotec. All rights reserved.